It ain’t a secret anymore. Apparently it’s been four years in the making. We were hit with the opening salvo a year ago in the form of an Skrully Electra. And now it’s here. What has been a really satisfying slow build up has now exploded into an intense, in-your-face declaration of war. I enjoyed the first issue, but at the same time, I kinda wish we could go back to the prelude. 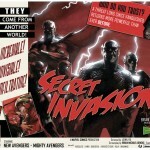 Part of the reason for this is that the title Secret Invasion is a bit of a misnomer. It really isn’t a secret anymore…it’s a full out invasion. While Tony Stark, Hank Pym, and Reed Richards are investigating why the Skrulls are invisible to any detection powers, SHEILD tracks a Skrull transport that crash-lands in the Savage Land, and Iron Man’s Avengers go to investigate. Except Luke Cage’s team of renegade Avengers decide to steal their Quinjet so they can get there first. This delays Iron Man’s team all of three minutes and they have a stand off in front of the transport. Then all hell breaks loose as the Skrulls attack at several strategic locations across the globe, each with a cultish “He loves you” mantra. I had to read this twice to decide if it was a good issue or not. 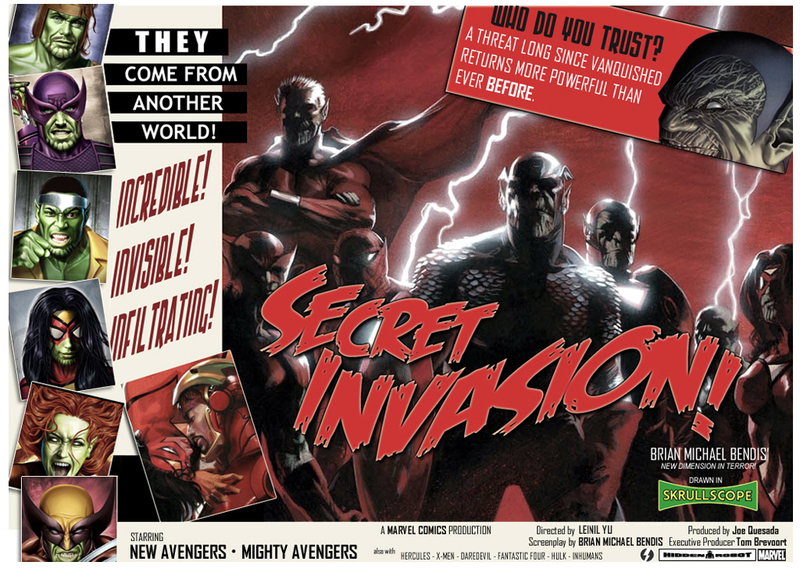 What I liked about the months leading up the event (dubbed Secret Invasion: The Infiltration) the suspense of not knowing who was a Skrull and who wasn’t, how long they’ve been masquerading as our heroes, how long they’ve been here, how many there are, and what happened to the heroes they’ve replaced. Those questions are quickly tossed out the window, and while we are not given the answers, they’re replaced with a flurry of battles, double crosses, and surprise reveals (and some not all that surprising). I felt it was too much for the introductory issue of the event. Despite all this, it was fun if a bit rushed. I still really don’t like Leinil Yu’s artwork…the lines are too heavy, the proportions off, the action sequences are sloppy, and his females all look like Aunt May on Halloween. Look at the attack on the Black Widow…probably one of the most sloppy representations of Spidey’s webs that I’ve ever seen. Final word: it’s a good, if not great, opening that makes me intrigued for the rest of the series. This entry was posted by Michael	on Sunday, April 6th, 2008 at 3:30 pm and is filed under issues, Marvel. You can follow any responses to this entry through the RSS 2.0 feed. You can leave a response, or trackback from your own site.